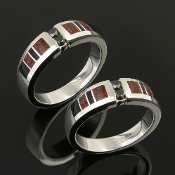 We offer several styles of unique hers and hers wedding ring sets for women. Keep in mind that any of the rings you see in our his and hers wedding sets could also be created in hers and hers wedding ring sets. 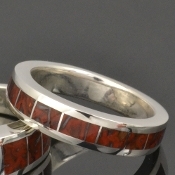 You can also mix and match styles, widths, inlay materials and gemstones. Your wedding rings don't have to be exactly the same to look like they belong together! 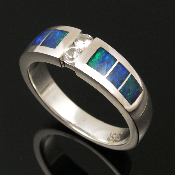 It will take about 4 to 6 weeks to create your new wedding rings in your ring sizes. 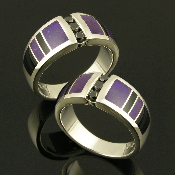 Our hers and hers wedding sets may be customized by substituting inlay materials, gemstones or the metal used. Metals available are Continuum sterling silver (a high tech version of standard sterling silver that is highly tarnish resistant and more durable), 316L stainless steel, and 14k gold in both white or yellow. Contact Mark or John for pricing on customization at (623) 518-6588! Take a look at our women's ring section for more ideas for the perfect wedding ring set for you and your partner.